Former Indian prime minister Atal Behari Vajpayee has died aged 93. He was being treated for age-related illnesses in Delhi's AIIMS hospital. Vajpayee was one of the founding members of the Hindu nationalist Bharatiya Janata Party (BJP), which currently governs India. It was the first time India had carried out nuclear tests since 1974. The experiments had taken place without any warning to the international community, which led to widespread outrage and concern. Prime Minister Narendra Modi led condolences in a series of tweets, calling Mr Vajpayee's death a "personal and irreplaceable loss." The BBC's Vineet Khare who was at the AIIMS hospital when the news of Vajpayee's death was announced, says supporters carrying the former prime minster's pictures began gathering at the hospital and shouting slogans. "He was a charismatic politicians who took pride in India and took everyone along. He will be missed," one of them said. Mr Vajpayee also tried to improve India's relationship with neighbouring Pakistan, which drew criticism from some Hindu nationalist groups. He boarded a bus to travel to the Pakistani city of Lahore in 1999 for a remarkable summit with Nawaz Sharif, who was then Pakistan's prime minister. The two men, both under immense pressure and politically weak, agreed to a number of confidence-building measures. But tensions with Pakistan intensified once again after the seizure of power by the Pakistani army under Gen Pervez Musharraf. And in December 1999, an Indian airliner was hijacked by Pakistani militants en route from Kathmandu, the Nepalese capital, and Delhi and was flown to Afghanistan. There was anger that the Pakistani authorities had allowed the aircraft to land and refuel in Lahore. 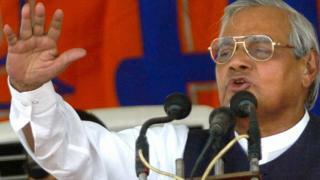 Mr Vajpayee was considered one of India's best orators, enabling him to connect with millions of Indians across class and caste divides. He was also a successful poet in the Hindi language and published a number of books.